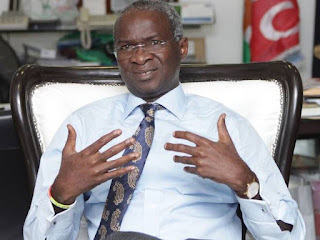 The then-collapsing economy and mess created by his administration discouraged former president, Dr. Goodluck Jonathan, from contesting the outcome of the 2015 election, the Minister of Power, Works and Housing, Mr Babatunde Fashola, said. Speaking in Lagos yesterday at an interactive session themed: ‘PMB’s Scorecard On Power, Works And Housing: The Journey So Far’, Fashola said when government changed in 2015, people voted for the message of the All Progressives Congress (APC) which was anchored on ‘Change’ because many were dissatisfied with what was going on. “Many didn’t know what happened in detail. One of the reasons, it seems, that they did not contest the outcome of the election was perhaps because the economy was already paused. It does not matter whichever government that took over, they knew everything was down. The foreign earning from crude oil at the international market was falling at an alarming rate. So, when the cash was no longer coming in, they felt like, ‘let them come and take it over’, after all this is a sinking ship,” Fashola said. On power, the Minister said though the major stakes in the sector had been privatized, the current administration hadraised power generation from 4000 megawatts met on assumption office in 2015 to the current 7000 megawatts. He added that power stations including the ones at Azura, Kaduna and Afam were ready to function and provide additional 1000 megawatts any moment from now.